The Type I portion of this system produces 18.2 megohm-cm ultrapure, reagent grade water at a flow rate of 2-Liters/minute. Continuous recirculation is utilized to maintain maximum water purity. Therefore, ultrapure water is instantly available on demand up to 7 feet from the system via the provided hand held remote dispenser. The digital Conductivity/Resistivity monitor displays the water quality and a Green LED indicates that the water quality is above the acceptable purity. When the water quality drops below the desired purity, a Red LED alerts the user that it is time to replace the filters. 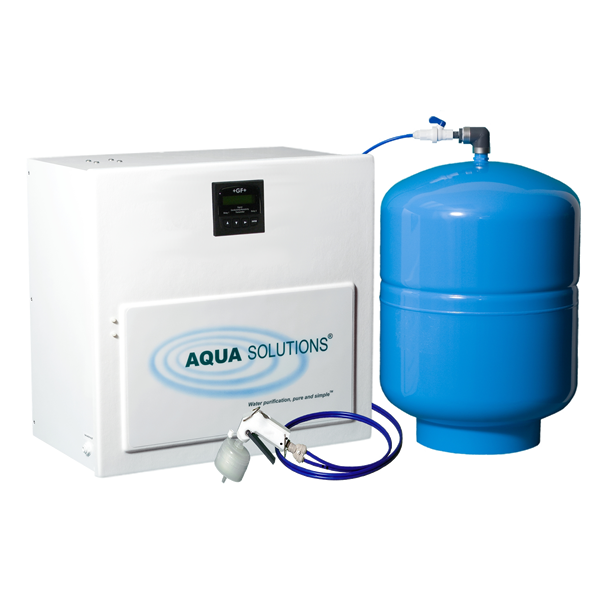 This affordable lab water system is simple to install and is easily maintained by the user. The system cabinet can be bench, shelf or wall mounted and the RO storage tank can be installed up to 20 feet from the system. An additional RO membrane can be added to the system to increase RO production and the storage tank can be upgraded to increase capacity. High Flow/High Capacity (8-12 Liters/Min) versions of this system are also available (see Models: RODI-2000-01A or RODI-2000-03A). 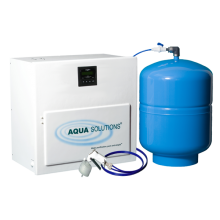 This compact, combination Reverse Osmosis plus Type I Analytical Grade DI System is utilized in operations using virtually any quality tap water that contains less than 1,000 PPM of total dissolved solids.